Sambal oelek is an Indonesian hot sauce that was recently made popular in America by a company in California which makes a local version of this sauce using very hot chile peppers. We are pleased to offer you the "real thing", sambal oelek made in Indonesia, Kokita brand, to the highest quality standards. 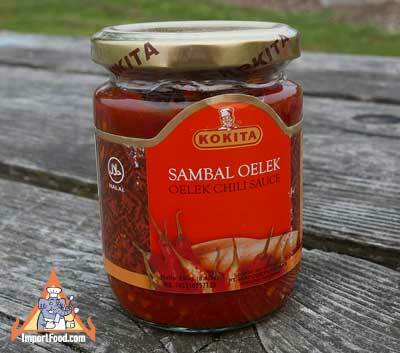 Sambal oelek can be used to heat up anything you desire, such as soups or spring rolls, pizza, whatever you like to heat up. This is made with pure red chile peppers which are hot very but also have a hint of fresh sweet flavor. This product is similar to sambal terasi. The heat level is high, and it will make you sweat if you eat too much, but it's also chunky and sweet. Also see a modified version of sambal: Sambal Sweet Chile Sauce from Martha Stewart. In the March 2009 issue of Martha Stewart Living magazine, this recipe was featured along with a suggestion to purchase Sambal Oelek from ImportFood.com. The endorsement of American icon Martha Stewart is an honor, and we're happy to share this with you. We've appreciated the recipes of Martha Stewart for years, especially starting in 2004 when we discovered her "Annual Recipes" book contained so many good recipes that we were constantly referring to it. This recipe for sweetened, salty chile sauce really hits the tongue well, and it goes with just about everything especially spooned into soups such as Vietnamese Pho.